Britain's Parking Hell is a TV show on British national television from Channel 5 with an average rating of 3.2 stars by TelevisionCatchUp.co.uk's visitors. 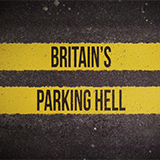 We have 8 episodes of Britain's Parking Hell in our archive. The first episode of Britain's Parking Hell was broadcast in April, 2019. Did you miss an episode of Britain's Parking Hell but don't you wan't that to happen in the future? Please set an alarm and add Britain's Parking Hell to your favourites, so we can remind you by email when there's a new episode available to watch. For free! The police make antisocial pavement parking a top priority. A look at life on oversubscribed Sawyers Park Lane. A woman continues her battle against private parking firms. Parking officers reveal how they face abuse and threats. In Hereford, the police are making antisocial pavement parking a top priority. But when their 'operation pram' pushes pavement parkers on to the road it causes issues for the emergency services. One campaigner is on a mission to hold those who wrongfully park in parent-and-toddler spots to account. Sawyers Park Lane is seriously oversubscribed, with six schools, two care homes and more besides. And, the inventive dad determined to make school-adjacent streets safer. Parking attendants in Weston-super-Mare brace themselves for a bumper Bank Holiday Weekend, residents in a Cornwall village descibe how 'Poldark' fans have created parking havoc, and Sue continues her one-woman war against private parking firms.